Eversince I was a child I've always wanted to go to Disneyland. Curiosity grew even more when I saw my first Disney's Hollywood Parade in television. 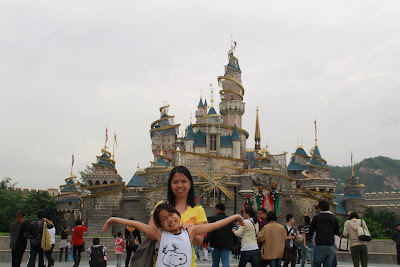 Today, it's my daughter's lucky day on her eight birthday as we visited the Hong Kong Disneyland. I am happy as she experience the magical world of Disneyland and meet her favorite characters in person at her young age that I would wanted to eversince. I saw in her eyes the excitement and joy. Too bad that we were not able to embrace with other characters because of too many people lining up in every characters booth. But lucky enough to see two different parades specially for these Christmas Season which is the Santa Mickey's Toy Riffic Street Party. And the Flights of Fantasy Parade. Characters parade in a colorful float, sings and dances in a tune of famous disney songs, our favorite Toy Story character, Woody, was there too. Latter part of November is truly a great time to go to Disneyland since the atmosphere is cool and the decoration is very festive for the Christmas Season. Here you can see lots of theater shows such as The Golden Mickeys and The Festival of the Lion King among the few, it's truly amazing to see the show, you'll get back to time we you were just small and everything seems so wonderful. Hong Kong Disneylang may be considered to be the smallest Disneyland in the world but visiting the park is truly an awesome experience. We wanted to go back next year.